is the most widespread and numerous bear in North America where its range extends from the northern tree limit of the Arctic far to the south through most of Canada and the United States. 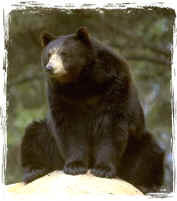 In fact, this bear is found as far south as the range of the Sierra Madre Mountains in northwestern Mexico. The area includes 32 American states; all the provinces and territories of Canada excluding Prince Edward Island; and 5 Mexican States. Preferred habitat includes forests with occasional open areas such as meadows. Excluded are areas where heavy de-forestation has occurred. It is estimated that there are somewhere between 400,000 and 750,000 black bears throughout North America. The adult bear is generally 35 to 40 inches tall when on all fours; is 4 1/2 to 6 feet in length; weighs 125 to 600 pounds. Males within a specific geographic area are, on average, about a third larger than females. Fur color varies from black to a blue-white color but also includes light brown, dark brown, cinnamon and beige. Black bears have a heavy body, short tail, rounded ears, plantigrade feet and a hind foot with five toes. Their curved claws are highly adapted to tree climbing and all black bears are agile tree climbers. The black bear lacks the distinct shoulder hump of the brown/grizzly bear. Being much quicker than they look, the black bear has been recorded reaching speeds of over 25 miles per hour for a short distance. They are also very capable swimmers. Being a seeker of foods which return the highest nutritional and protein value for the least expenditure of energy the black bear’s diet usually consists of more than 75% of vegetable matter that includes berries, flowers, grasses and sedges, herbs, tubers and roots, and nuts of all kinds. The balance of its diet is supplemented with animal matter such as decaying animal carcasses, fish, small marine animals, ants and other insects, honey, elk and moose calves and a variety of other small mammals such as ground squirrels and marmots. Bears like to feed in the cool of the evening or in the early morning but during the late summer and early fall all bears have an imperative need to gain as much weight as possible as the hibernation period nears. At this time black bears will normally make very large weight gains and may forage around the clock with only short rest periods. Depending on weather climates, black bears will hibernate between four and seven months in a den it has dug, hole up in a dense brush pile, hollow log or tree cavity or enter a cave. Where weather is much more temperate and the period without food available is quite short, black bears may not hibernate or they may simply nest in a thicket or other sheltered area for brief periods of time. While hibernating a bear’s heart rate drops from between forty to seventy beats per minute to only eight to twelve beats per minute and its metabolism slows down by half as an energy saving process. 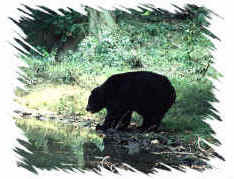 Female black bears normally mature at 3 to 5 years of age. In warmer climates mating may take place as early as May or June: in colder climates July or early August. The breeding season lasts two to three weeks and the female normally mates with several males over that period of time. After mating a process referred to as delayed implantation takes place. The fertilized ovum divides a few times and then floats free within the uterus for about six months with its development arrested. Sometime around the denning period the embryo will attach itself to the uterine wall and after a period of eight weeks the cubs will be born while the mother is still in hibernation. The delayed implantation process insures that the mother bear has enough fat reserves to carry her through the winter and if that is not the case the embryo will not implant but is simply reabsorbed by her body. Females will normally breed every other year. The number of cubs born varies from one to a maximum of four with two cubs being the average. At birth the cubs are blind, hairless and very tiny. They weigh from 8 1/2 to 11 1/2 ounces. In the first five weeks the cubs will develop rapidly while nursing on their mother’s calorie rich milk and will be able to follow their mother when she leaves the den. The life span of black bears in the wild can be twenty-five years or more. The American Black Bear is the one bear species which seems to have the greatest capacity to live in close proximity to man. 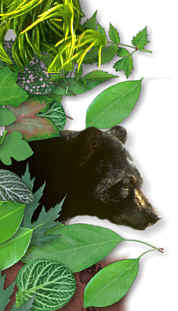 Black bears have lost over 60% of their historical range. As human encroachment increases, preserving large areas of undeveloped land where bears and other animals can thrive is extremely critical. Crucial components include adequate sources of food and water, denning sites such as rock crevices, hollow trees and dense vegetation, contiguous travel corridors with sufficient cover for protection from poachers, harassment, and associated dangers from human development.